Gemini is Thomas More College’s program that introduces college-bound students in their junior or senior year of high school to both college-level coursework and Thomas More College. Students participating in Gemini will sample college textbooks and grapple with college-level expectations. It also encourages collaborative efforts between tri-state high schools and Thomas More that are designed to benefit the students and to foster intellectual growth. 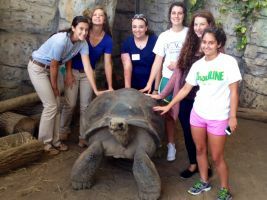 The WAVE Foundation has partnered with Thomas More College to offer a Marine Biology COLLEGE course at the Newport Aquarium. Participants will earn 3 college credits (transferable to any school) while learning about Marine Biology from Dan Hagley, Newport Aquarium Biologist, and Dr. Lorentz, Biology Professor at Thomas More College. Gemini will be offered to current WAVE Foundation volunteers first, if space remains, it will then be opened up to the public. Space is limited to a maximum of 13 students. Participation is open to current high school juniors and senior. Students must submit a high school transcript showing the student has completed 2 units of English, 2 units of Mathematics, 2 units of Science and 2 units of Social Studies. Students must have an overall GPA of 3.5 or better in the above units. If the student has taken a standardized test (ACT or SAT), it is requested that the student submit those scores along with their transcript. Students wishing to participate in Gemini must first complete the WAVE Foundation’s pre-application. If accepted into the program, they will be asked to complete Thomas More College’s EAP/Dual Credit Application. EAP and dual credit students must submit a high school transcript and application each semester (those dual credit students enrolled in a year-long course only need to submit a transcript and application each year). Upon receiving the application, the Program Coordinator will contact the student to arrange a registration appointment. Once enrolled, the student is registered as a Thomas More student, is assigned a student ID number and will have an official academic record of this course at Thomas More College. Students will receive a Thomas More grade report for each course taken for credit, and these credits are transferable to other accredited colleges and universities, subject to each institution’s transfer policies. Students planning to transfer the credit hours to other institutions must contact the Registrar’s Office to request transcripts to be sent at a cost of $5.00 each. 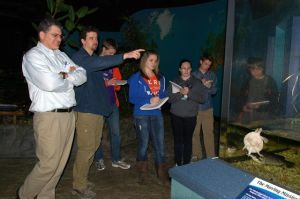 The cost of the course is $400 per student and includes weekly lectures at Newport Aquarium, followed by hands-on activities throughout the Aquarium. Books are not included in the course fee. This fee is payable upon registration. The Thomas More College withdrawal and refund policies apply to the Gemini Program. Upon completion, participants will earn 3 college credits that are transferable to any school. In addition to the college credit, a student registered at Thomas More College through the Gemini Program enjoys many of the same privileges our students do, including attending Student Life events on campus, access to the college’s computer network, a Thomas More email account and library access. Students in the Gemini Program who later show interest in attending Thomas More College must complete a separate application for admission. The admissions application fee will be waived for all Gemini students. Click here to learn more about Thomas More College and the Gemini Program.